As an expression of cultural joy, you can’t top an Irish wake. And what is a wake but a celebration-a toast of appreciation-an expression of love-and a damn good party? 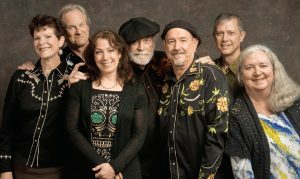 So when seven top Bay Area musicians realized they shared as deep a love for the songs of the Grateful Dead as they did for traditional Celtic tunes, some brand-new music sprang up and started partying. WAKE THE DEAD is a romp that flows seamlessly from rock grooves to hot Irish reels, and from haunting airs to achingly beautiful melodies familiar to Deadheads everywhere. “Sugaree” in waltz time, bracketed by an ancient harp tune and infused with a poignant Celtic longing. “Bertha” thundering out of “China Cat” on a mandolin tidal wave. The eerie lilt of the uilleann pipes, giving a glow to “Bird Song” as if it was always meant to be there. Groove jams to keep the tie-dye swirling. Vocal harmonies that float like clouds. The music takes off, and the band follows, grinning all the way. These aren’t worlds colliding-they’re worlds meshing, coalescing­ creating a whole new world of possibility, and true to the spirits of the Grateful Dead and the eternally hopeful Celts. WAKE THE DEAD bands together seven of the best-known and most respected players in the west. Harper Maureen Brennan has toured for over 30 years and recorded the acclaimed “Harpistry” collection. Bassist Cindy Browne is equally at home in folk and jazz, touring globally as the musical fusion go-to gal. Singer, fiddler, and octave mandolinist Danny Carnahan is an award-winning songwriter whose original Irish-tinged songs are popular worldwide. Kevin Carr is a musical triple-threat, renowned as a dance fiddler, a pennywhistler, and Irish piper par excellence. Sylvia Herold’s delicious vocal phrasing can also be heard on her solo recordings and her performances with Euphonia. Paul Kotapish is known far and wide for his work with Kevin Burke’s Open House, and for his blazing guitar and mandolin with The Hillbillies From Mars and Euphonia. And Latin percussionist Brian Rice rounds out the band’s groove engine.